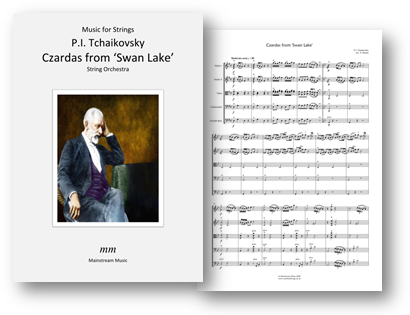 The exhilarating 'Czardas' from Tchaikovsky's ballet ’Swan Lake’, arranged for string orchestra. The PDF contains a part for violin III, doubling that of the viola. Click here to listen to a recording of the piece. Click on the image below to view and listen to the entire score on YouTube. Also available in an arrangement for full orchestra.